It has been a very busy start to the semester for the students and teachers of the Social Science Department. 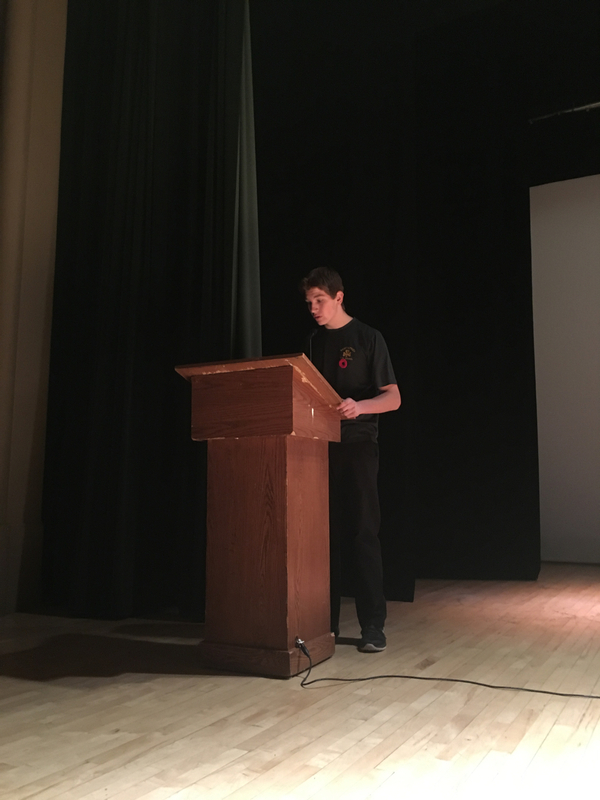 At the beginning of February, St. Patrick hosted its annual Grade Information Night. Our department had an opportunity to showcase our amazing programs and courses, demonstrating all the possibilities that the humanities provide. 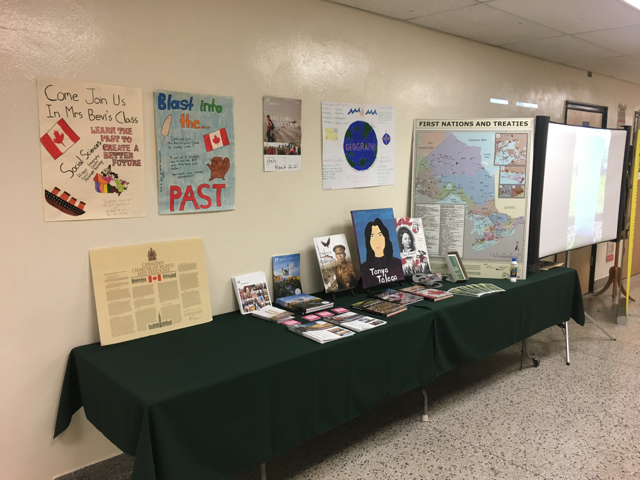 We also had a display on EF Educational Tours, whom we are proud to partner with to provide exciting history and geography based travel opportunities. 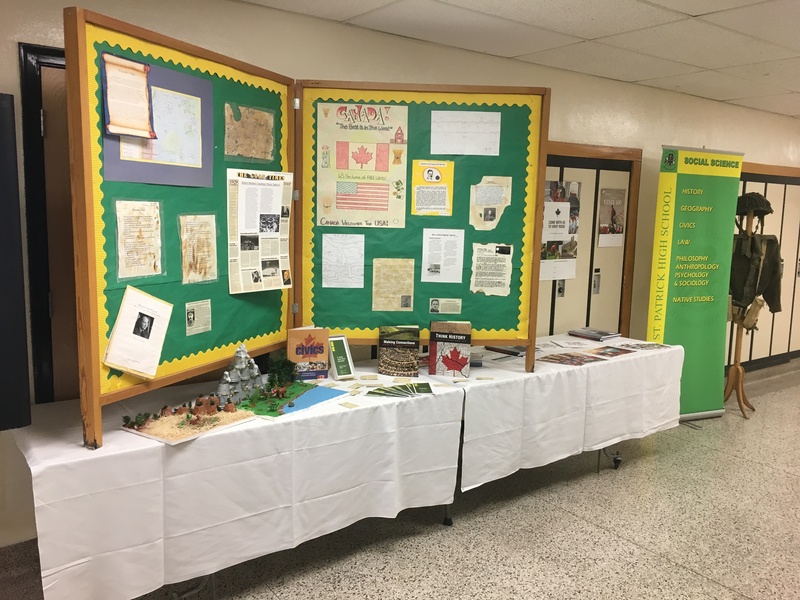 Social Science Display, February 2019. Speaking of travel, on March break 22 students and 3 teachers will be joining a group from St. Ignatius for an exciting history-themed tour of Europe. The group will begin their journey in Berlin, where they will visit such places as the Berlin Wall and the Sachsenhausen concentration camp. 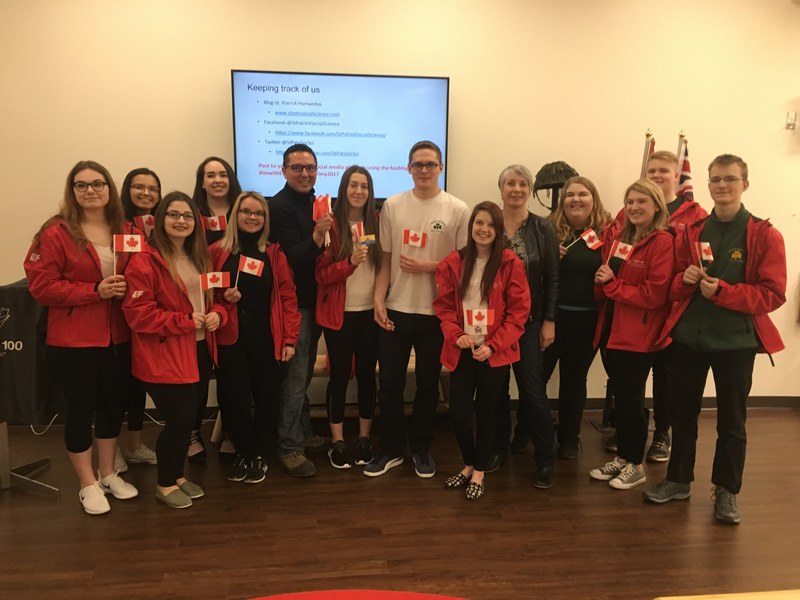 From there, they will move on to the Netherlands, visiting the Groesbeek Canadian War Cemetery and Anne Frank House in Amsterdam. 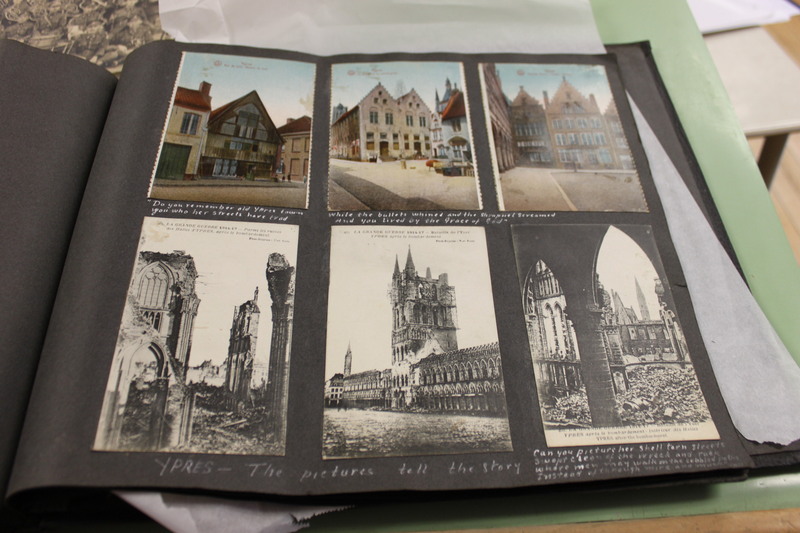 In Belgium, they will spend a day around the city of Ypres. In northern France, they will visit the Vimy Ridge and Beaumont Hamel battlefields before proceeding to Normandy and Juno Beach. The last day of the tour will take the group to the many sites of Paris. You can follow their progress on this site and on social media. St. Patrick & St. Ignatius students pray at the Bretteville-sur-Laize Cemetery, April 2017. As we head into spring, students in the Social Science Department have been very busy. 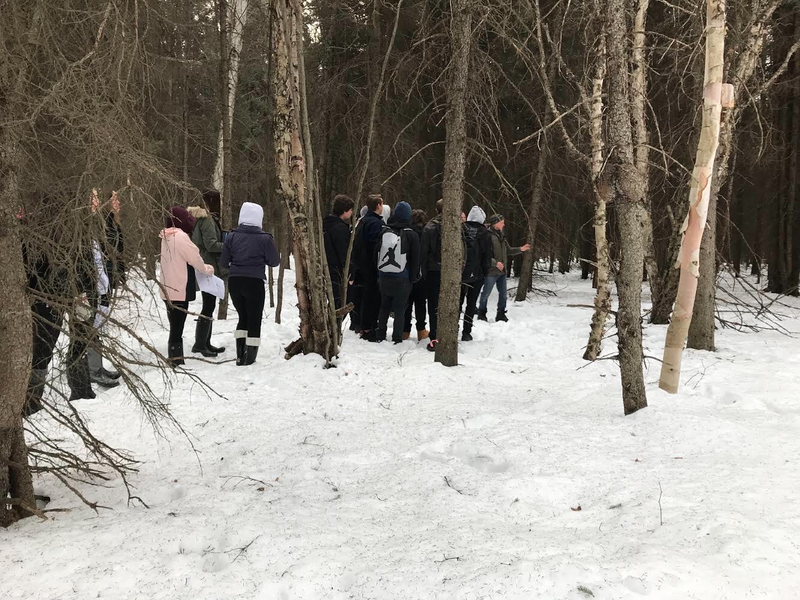 Students in Ms. Bernardi’s Grade 9 geography class had the opportunity to experience some fantastic hands-on learning thanks to Confederation College. 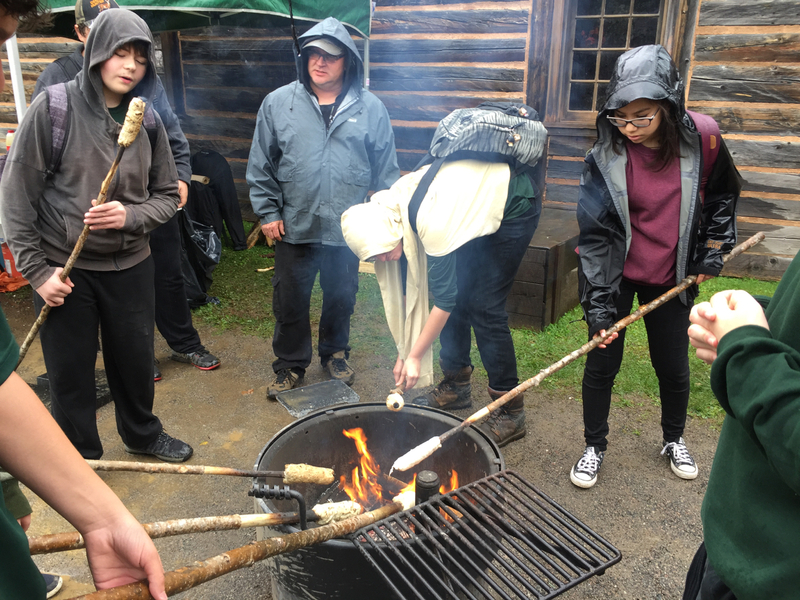 Keith Hautala, an educator at Confederation College led the class on a fun expedition outside. 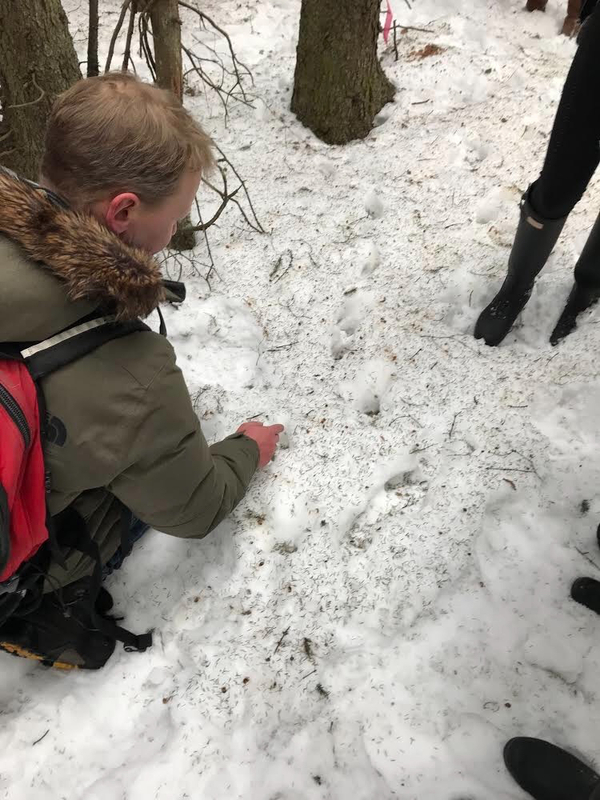 Keith kindly donated his time to help teach the students about identifying different types of animal tracks, properly documenting them and discussed how to integrate gathered information into GIS programming. Animals and GIS, March 2018. In just under a year, some of students and teachers will be heading to Europe for another history themed excursion. We have now filled all our spots and are eagerly awaiting the arrival of March 2019 departure date. During that time, the students will be preparing for the visit by researching some of the sites and cemeteries we will be visiting on the 10 day trip. You can read more about the trip here. 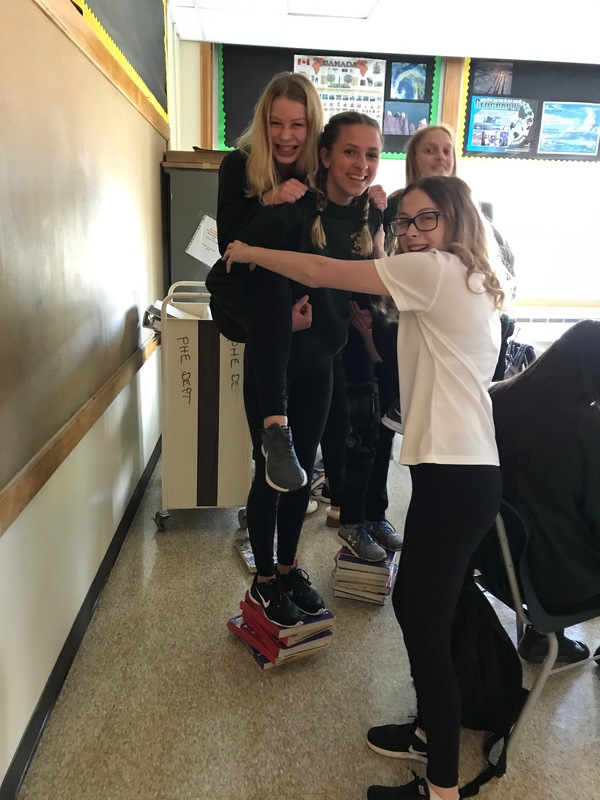 October was a very busy month for the students and teachers in the Social Science Department. 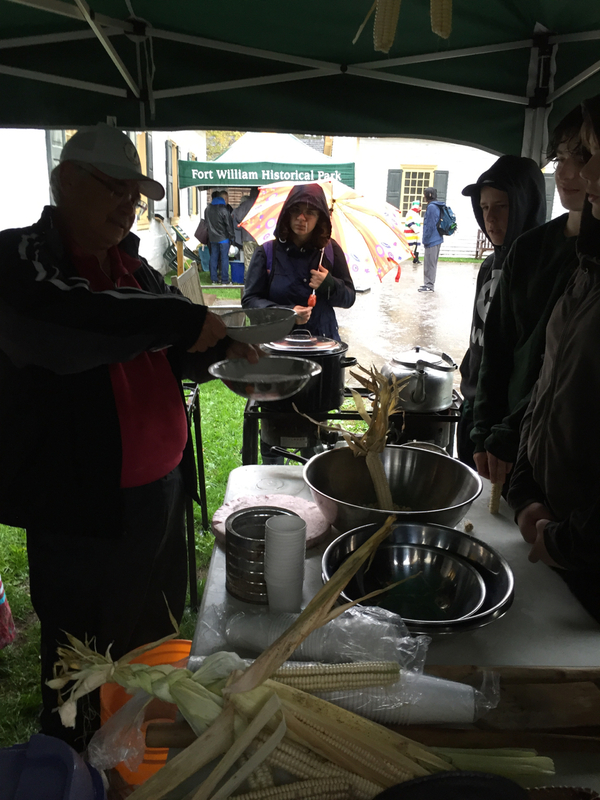 Students in our Grade 9 geography classes had the opportunity to travel to Fort William Historical Park to participate in the annual Fall Harvest program. 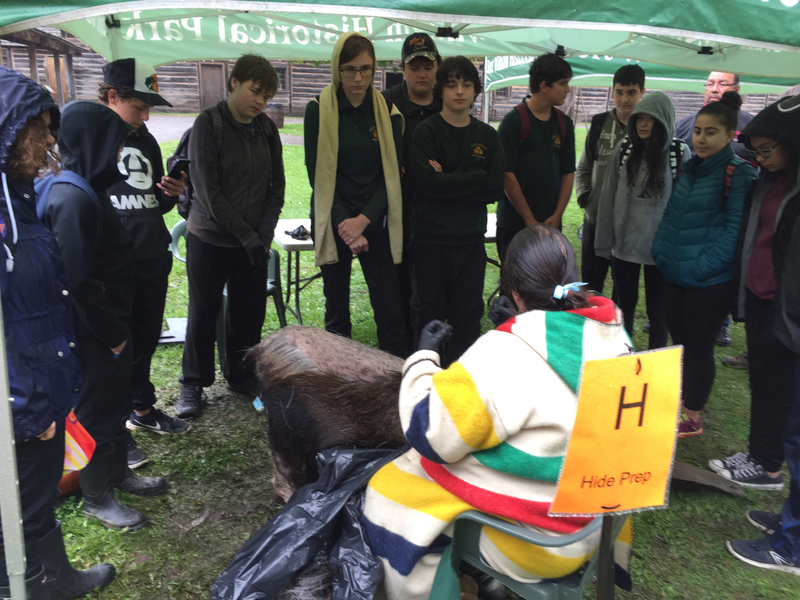 There they were able to learn about many aspects of Indigenous culture, such as harvesting wild rice, preparation of bannock and cleaning of hides. 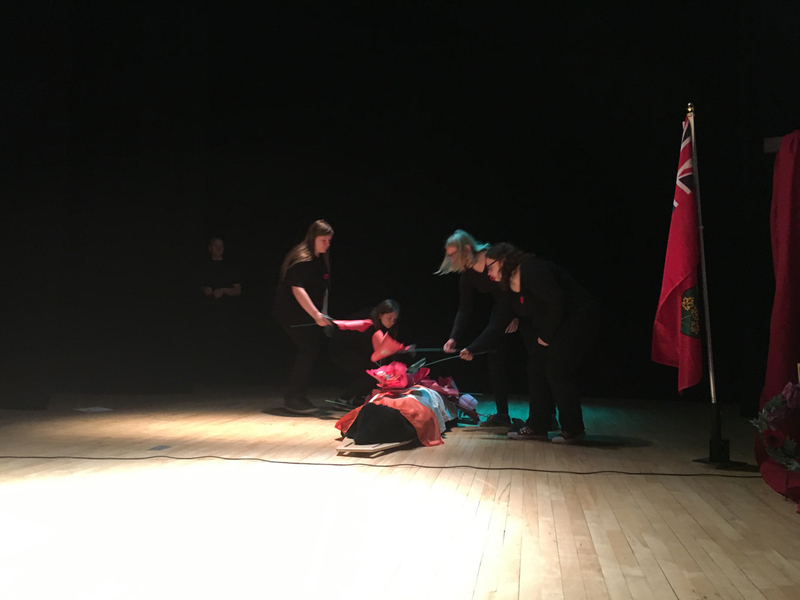 It was a great introduction to the history and culture of our First Nations people. 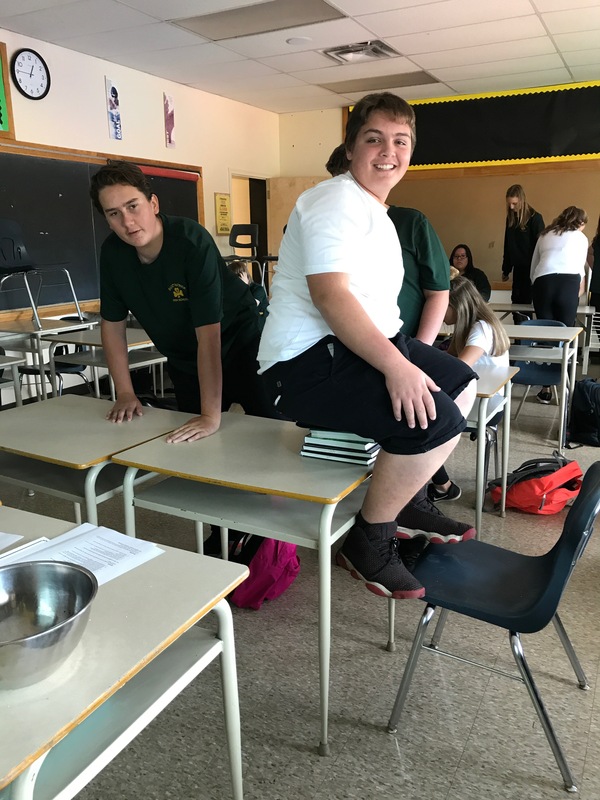 Students in Ms. Bernardi’s Grade 9 geography classes had a unique opportunity to apply their knowledge in their study of geology. They used different types of chocolate, coupled with heat, pressure and time, to replicate the rock cycle. 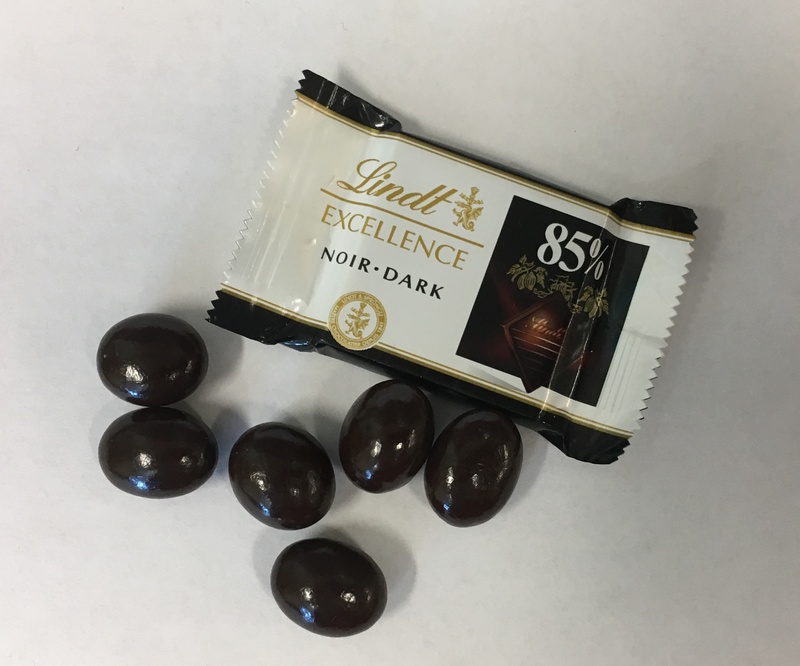 This unique application of hands-on learning allowed the students to see the process first-hand and more importantly, taste the fruits of their efforts. This year plans to be an exciting one for the students and teachers in the Social Science Department. 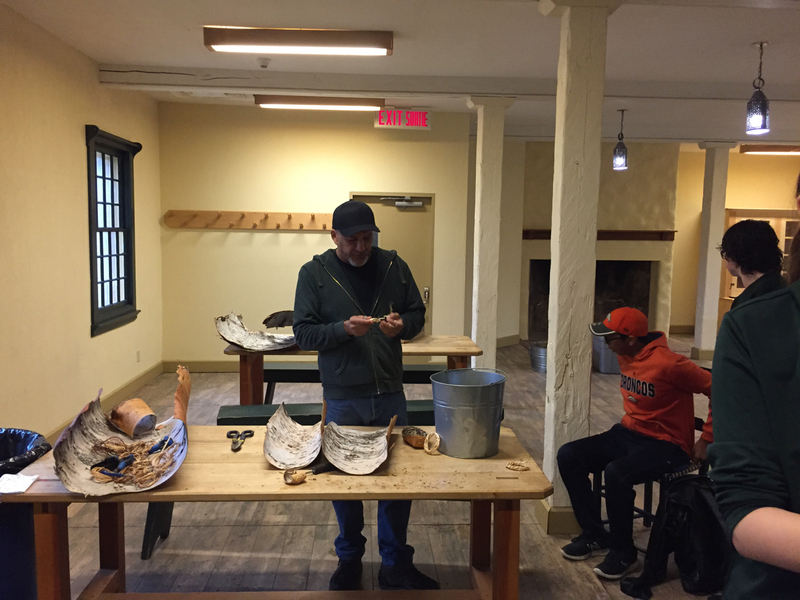 We will be involved in many great hands-on activities and field trips that will engage students in the learning process. We are again in the process of planning another overseas excursion to Europe for March 2019. The trip will take us to such places as Berlin, Amsterdam, Vimy, Normandy and Paris. 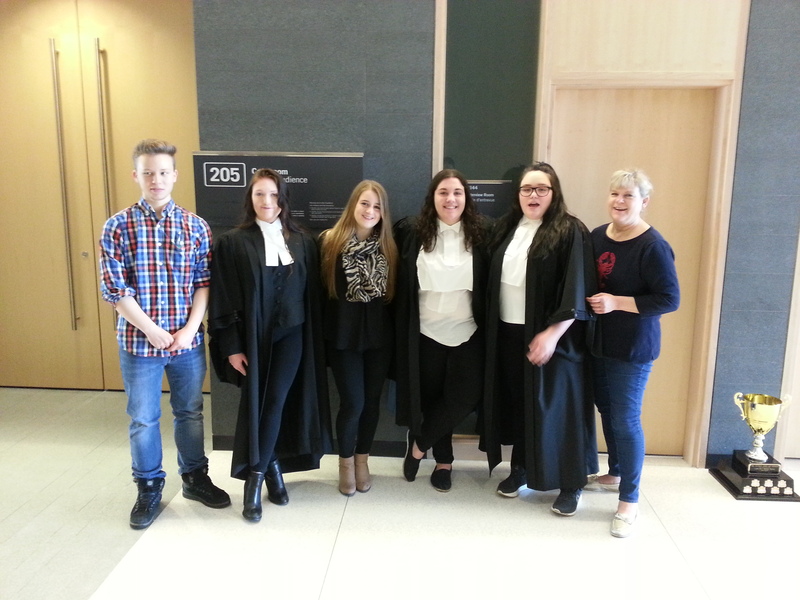 On April 7th, students from Ms. Cavar’s Grade 12 Law class participated in the annual Mock Trail at the Thunder Bay Courthouse. Our students emerged victorious against the team from Superior. Congratulations go out to lawyers Jessica Goettlicher, Jordana Casasanta and Bailey Hoard, victim and witness Jon Watts and witness Kailyn Haner. 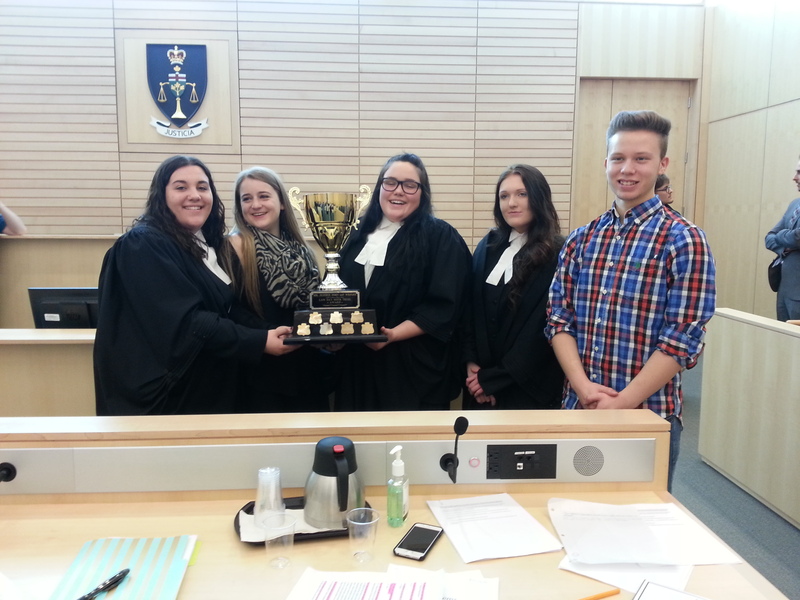 Jessica was named best lawyer at the trial. Great job everyone! St. Pats Team with Ms. Cavar, April 2017. With the trophy, April 2017. 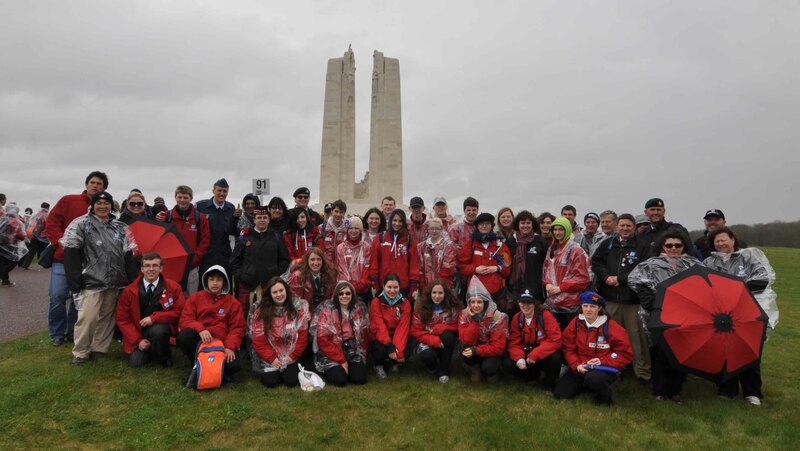 From April 5th to 15th, 23 students from St. Patrick journeyed to Europe to participate in the 100th anniversary of the Battle of Vimy Ridge. 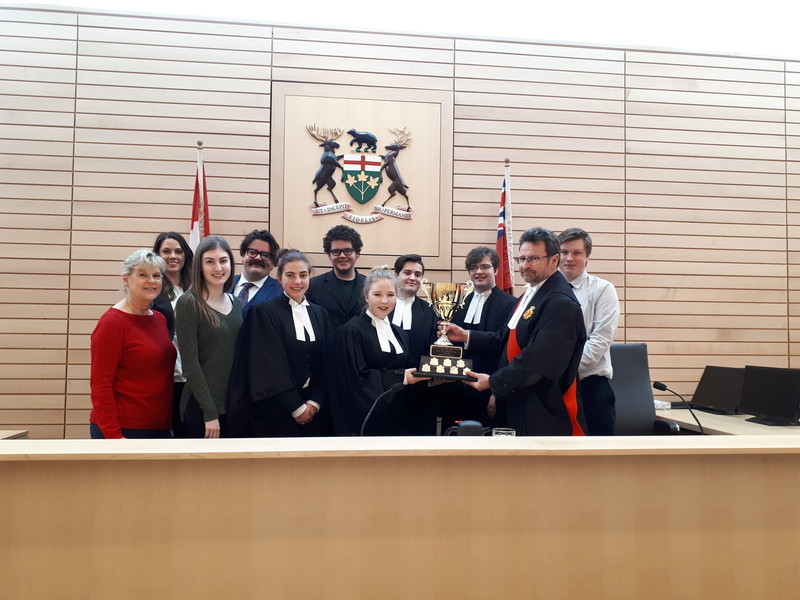 Travelling alongside students and teachers from St. Ignatius, the group was led by Mr. Battistel, Ms. Caza and Mr. Marcon. 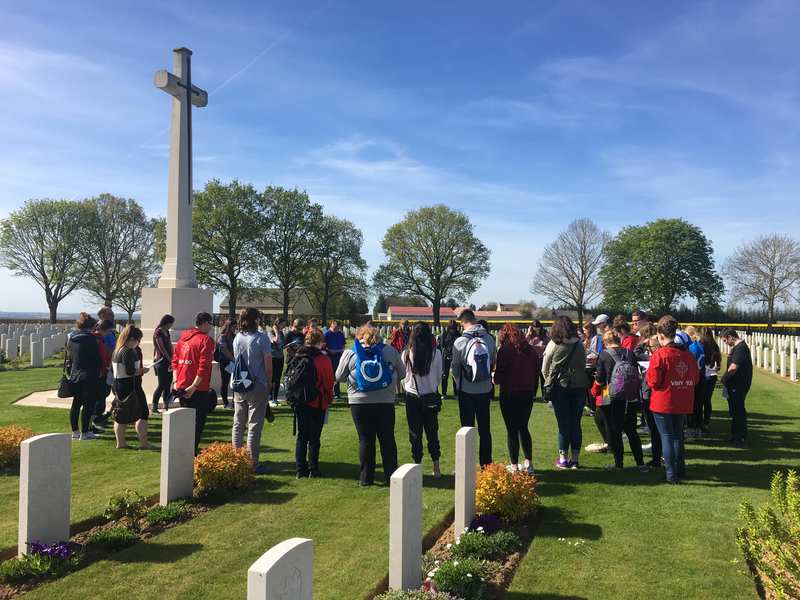 In addition to the Vimy commemorations, which was held on April 9th and attended by upwards of 25,000 people, the group visited Amsterdam, Ypres, Albert, Beaumont Hamel, Juno Beach, Honfleur and Paris. The trip was filled with an abundance of European history and culture. You can read a day-by-day account of the trip with photos by checking the archives. Vimy 2017 here we come! So here we are, less than 48 hours away from a great journey. The excitement, and anxiety, is palpable. 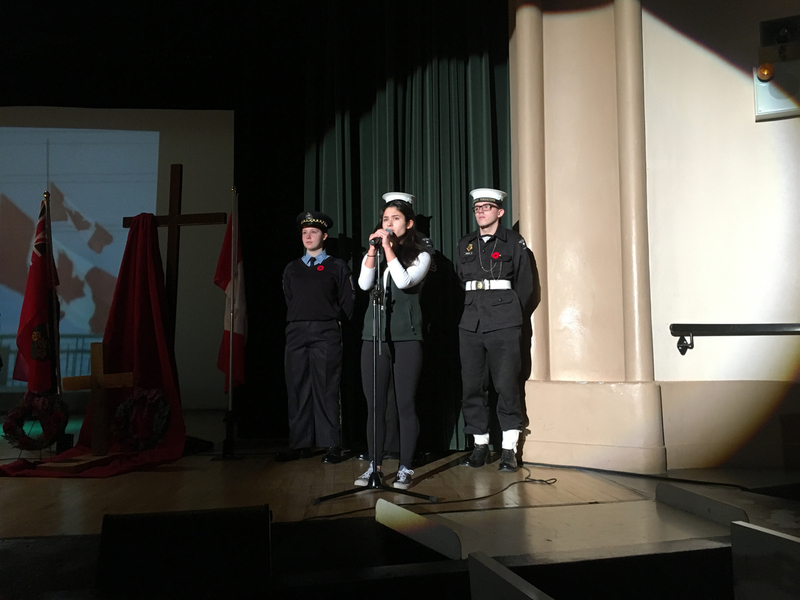 On Wednesday, 23 students and 3 teachers from St. Patrick will be departing for an 11-day trip to Europe, the highlight of which will be participation in the 100th anniversary commemoration of the Battle of Vimy Ridge. The last week has been insanely busy for all involved; all the last minute planning and meetings tend to be very stressful. On top of that, we have had a lot of media attention on what will be a once in a lifetime trip. 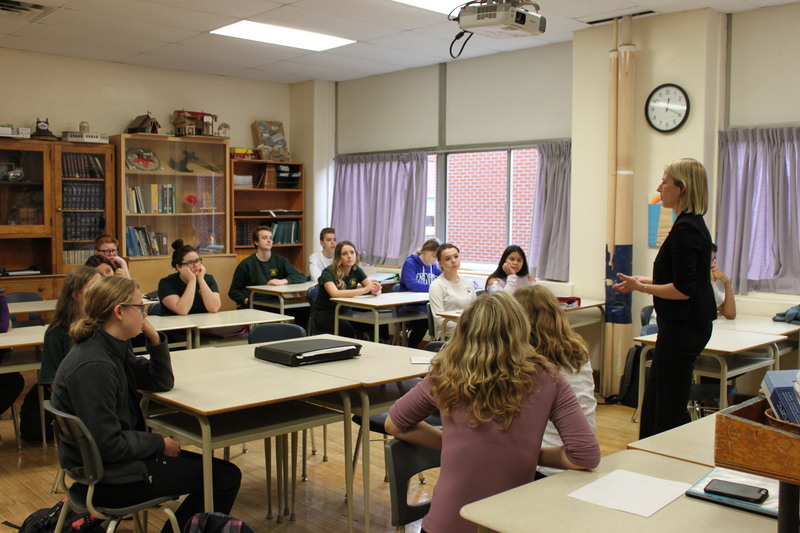 On Friday, March 31st, local MPs Patty Hajdu and Don Rusnak came by the school to present travellers from both St. Patrick and St. Ignatius will small gifts for the journey. 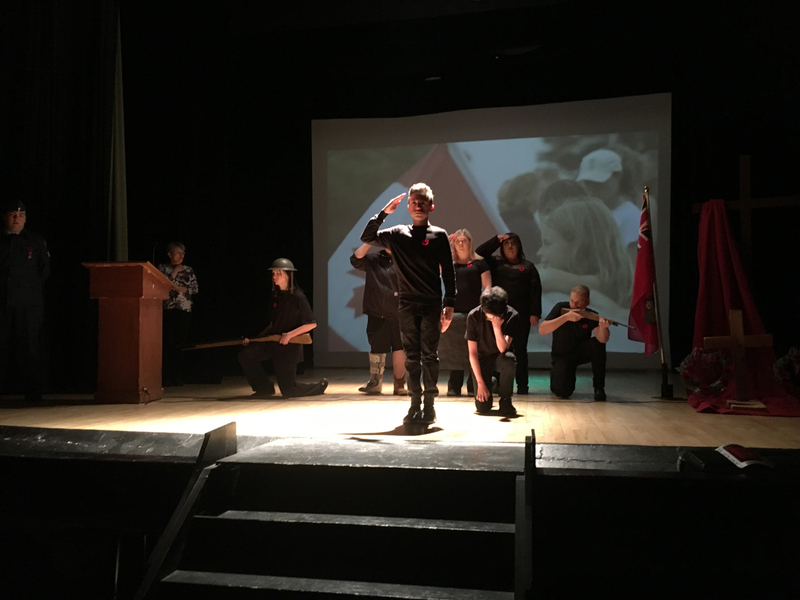 Also present was Lieutenant-Colonel David Ratz, who is the commanding officer of the Lake Superior Scottish Regiment (LSSR). 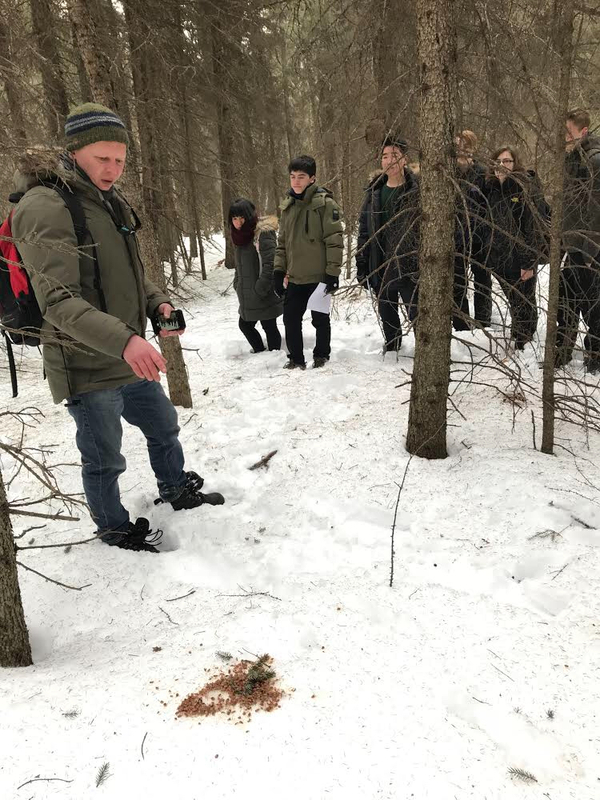 Our students will be visiting graves of soldiers from the 52nd Battalion and the Lake Superior Regiment in Europe, units that are perpetuated by the LSSR today. 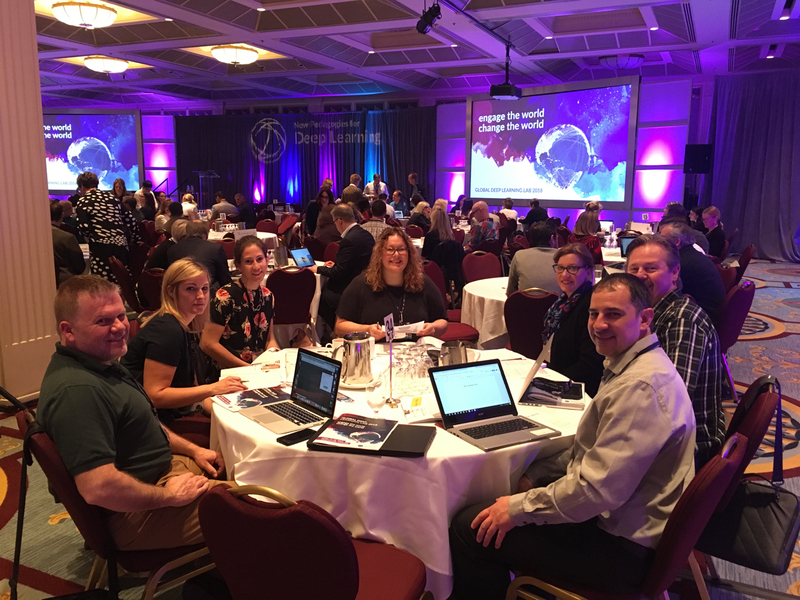 You can read more about the media conference on TBNewswatch, CBC and the TBT News. All of the travellers will come home with many great memories from the trip. They will also take home many physical reminders as well. 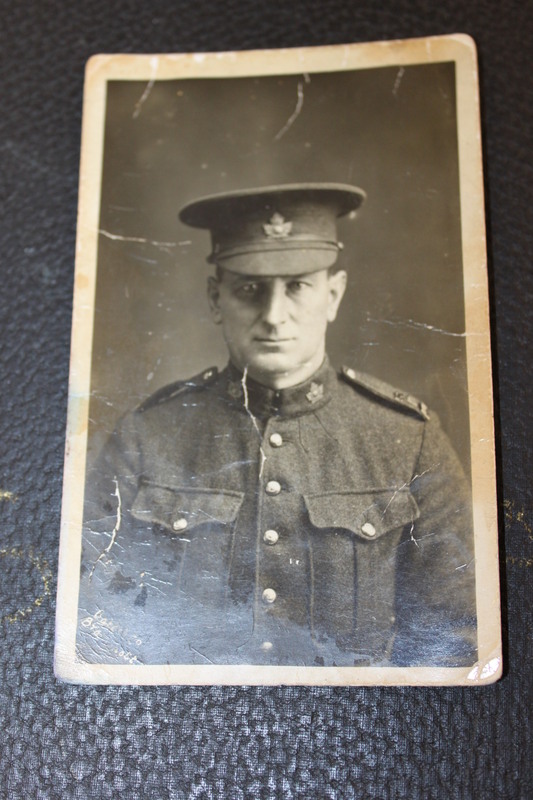 Anyone who visits Vimy Ridge is presented with the Vimy Pilgrimage Medal, which honours not only the sacrifice of those that fought there, but also those who have travelled to pay tribute to the fallen. The medal features the central image of the Vimy Memorial, which is the Spirit of Canada, or Mother Canada, weeping for her fallen sons. The ribbon bears the colors of the 4 Canadian Divisions who fought together at Vimy for the first time; red for the 1st Division, blue for the 2nd Division, grey for the 3rd Division and green for the 4th Division. Wifi permitting, we will be posting a day-by-day account of our journey on this site. Please follow us as we weave our way through the Netherlands, Belgium and France on this one-in-lifetime journey. It has been another busy month in the Social Science Department. Social Science Display, February 2017. Learning with hands-on activities is continuing in our classrooms. 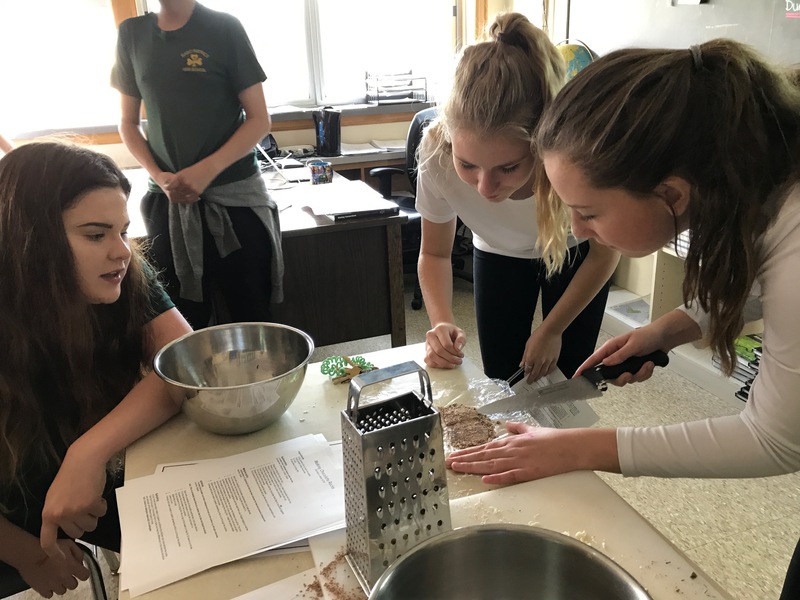 Students in Ms. Bernardi’s Grade 9 geography class were able to physically create the process of the rock cycle and also eat it too. 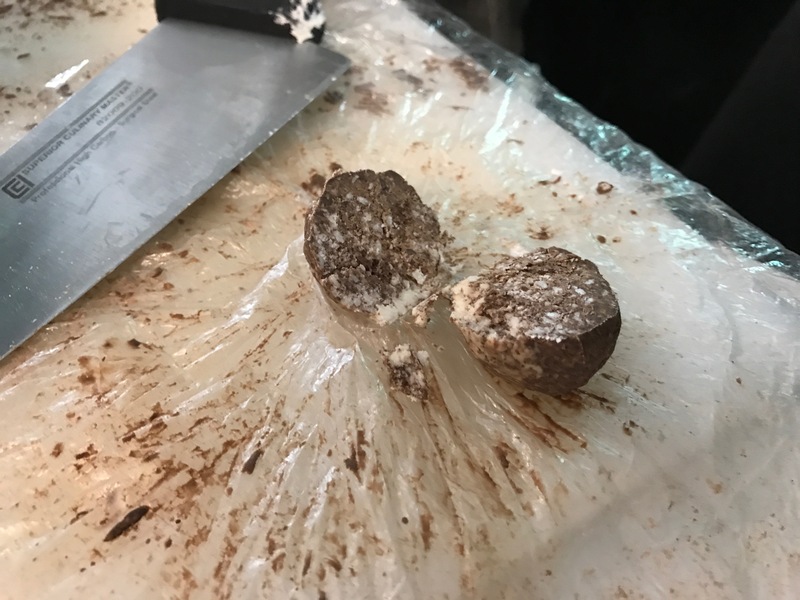 Utilizing chocolate, the students used heat, pressure and time to form the three different types of rocks; igneous, metamorphic and sedimentary. Once they had completed their “model,” they had the opportunity to savour their rock cookies as a snack! The department trip to Europe to commemorate the 100th anniversary of the Battle of Vimy Ridge is now only days away. 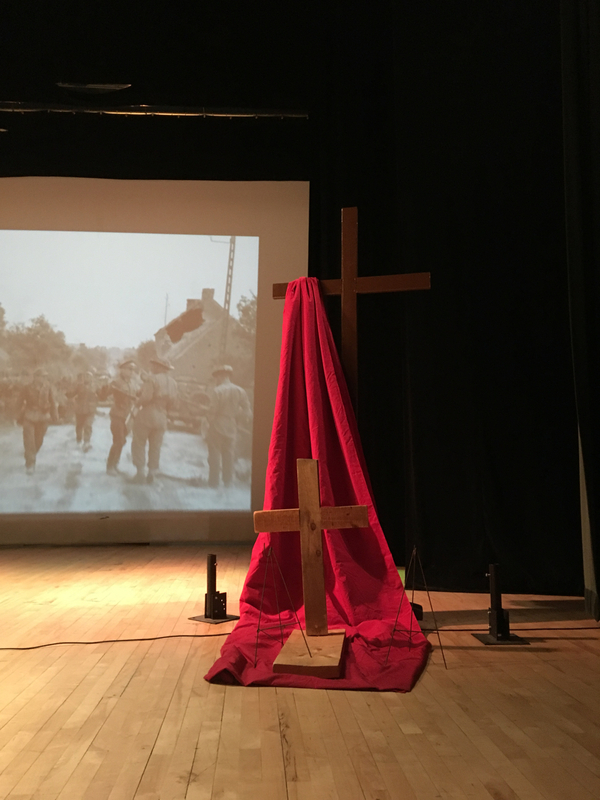 Twenty-three students and three teachers from St. Patrick will be joined by students and teachers from St. Ignatius as they make the pilgrimage for this once-in-a-lifetime event. It is estimated that 25,000 people will attend the ceremony, along with representatives from the government and the Monarchy. In addition to Vimy Ridge, the group will be visiting Amsterdam, Beaumont Hamel, Albert, Normandy and Paris. You can follow their progress via our website, or on Facebook and Twitter. 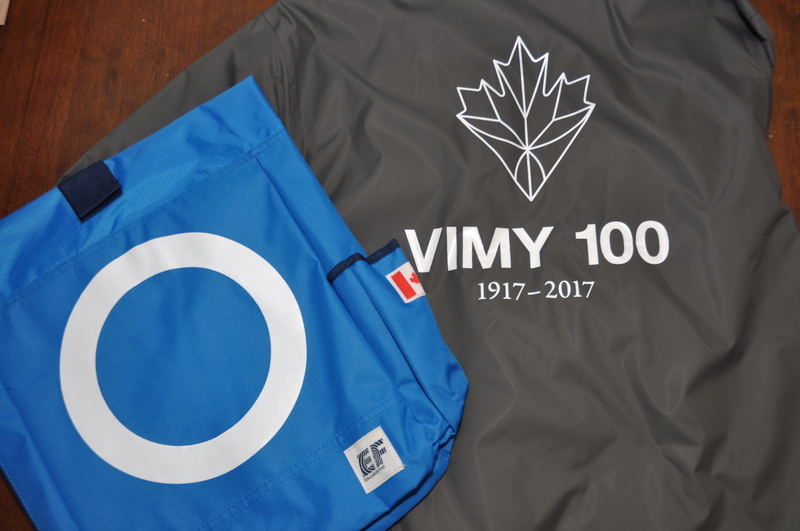 Vimy 100 backpack and jacket, March 2017. Please check back soon as we will posting details before and during our trip to Europe for the 100th Anniversary of Vimy Ridge. With the arrival of exams, another semester is drawing to a close for the students and teachers in the Social Science Department. One of the highlights of the semester has been our work on an inter-disciplinary task revolving around climate change. Students in some classes were asked to view the documentary “Before the Flood,” which was hosted and produced by Leonardo DiCaprio. They were then asked to write letters describing their thoughts on climate change, what they are doing to combat its effects and what they would ask of their elected officials regarding this issue. Their questions and ideas will form the nucleus of a video that will be created to address this important topic. As we move closer to spring, the pace of preparations for the department excursion to Europe in April are increasing. 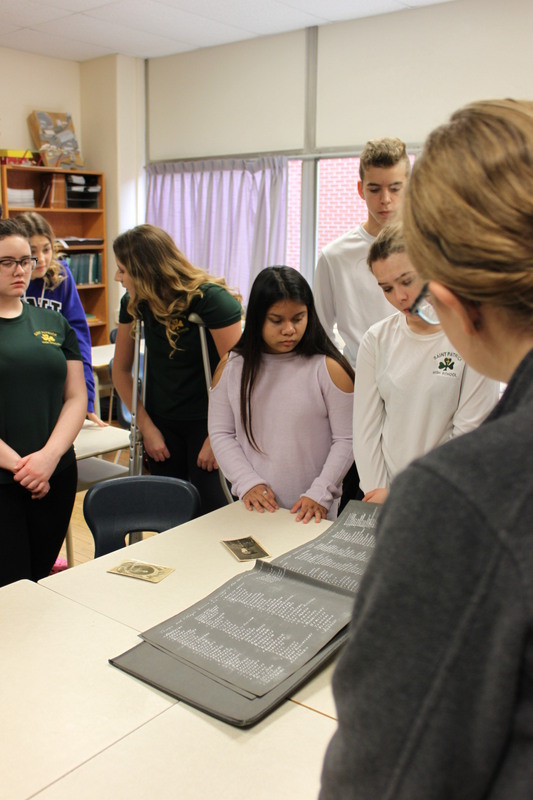 Travelling together with St. Ignatius, 23 students and 3 teachers from St. Patrick will be in France on April 9th to take part in the 100th Anniversary commemorations of the Battle of Vimy Ridge. We will be joining thousands of Canadians from across the country that will be on hand for the event. Flight itineraries have already been received for this 11-day, once-in-a-lifetime trip and excitement is building. More updates will be forthcoming and people will be able to follow their journey via the department website. St. Patrick students at the 95th Anniversary commemorations, April 2012.